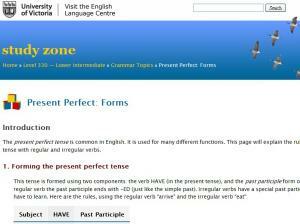 Do you know what the present perfect tense is and how to use it? This lesson has many interesting exercises, including a grammar reading and three levels of exams. 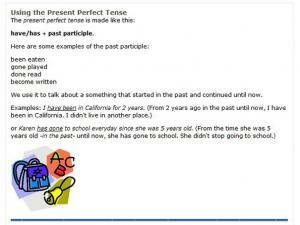 It explains how to form a sentence in the present perfect tense. Very good exercises included. 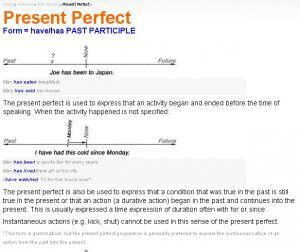 Explanation of how to form the present perfect. Good explanation. Accurate, but very basic, summary of the present perfect tense. Includes uses, a list of signal words, affirmative/negative forms and a link to practice exercises. No more confusion with ‘for’ and ‘since’! Depending on whether you want to talk about how long you have been doing something, or when you started doing something, you will need to use one of these two words. Find out which is which in this English grammar lesson! This is part one of a lesson in five parts. 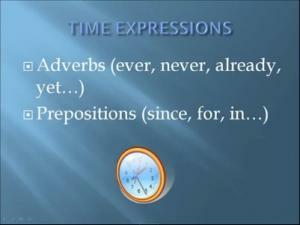 In this part, the teacher tells how to form the present perfect tense, and she begins to explain why this tense is used. This is part two of a lesson in five parts. 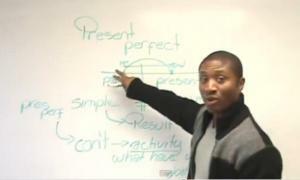 In this part, the teacher continues to look at reasons why the present perfect is used. 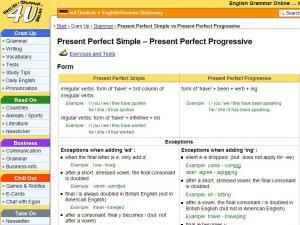 A contrast is made between the present perfect and the simple past. This is part three of a lesson in five parts. 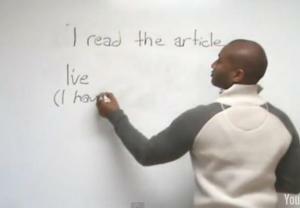 In this part, the teacher practices forming the negative and questions in the present perfect tense. 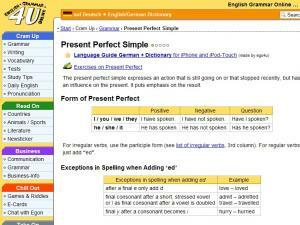 Reasons for using the present perfect are reviewed. Have you ever....? 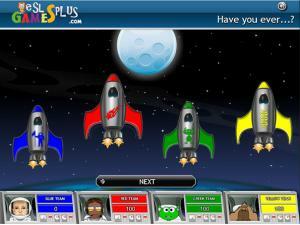 Read the sentences and select the correct 'have ever' present perfect phrase to fire your rocket. You can play this game on your own, or against friends, to see who can get their rocket to the moon first! 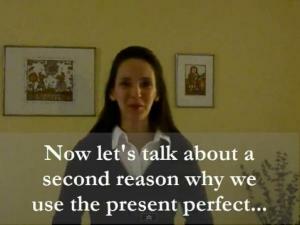 Explanation of the three uses of the present perfect. Very good exercises included. 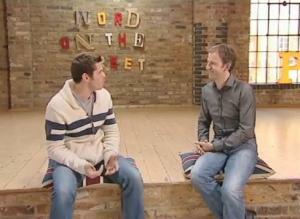 Rob the teacher talks about the present perfect. There is no transcript, but the speech is very slow. Includes four practice tasks. Practice the present perfect tense using 'have done' with this fun pirates game. 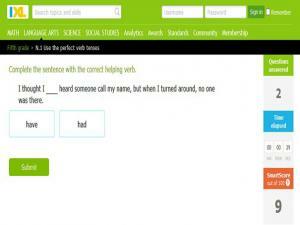 Read the phrases and select the correct present perfect phrase to use. Can you answer enough right to sink the other ship? 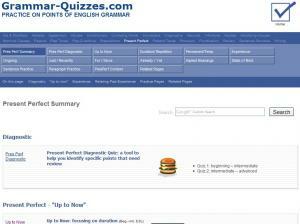 This site explains how to use the present perfect form of the verb. There are a few examples and then some questions for you to answer to check your understanding. 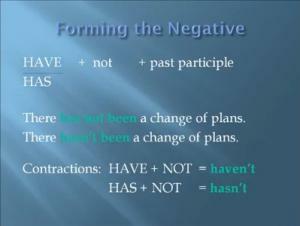 Describes when to use present prefect tense in several situations. There are some time diagrams to help to understand the concept. 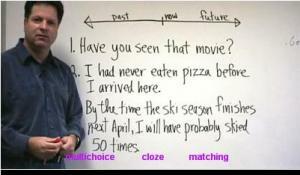 Two different tenses are presented in this lesson: present perfect and present perfect progressive. 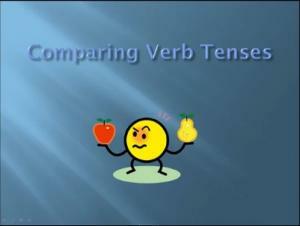 Not all verbs can be progressive and this lesson has a very good explanation of the difference between these tenses, using eleven exercises and two tests. 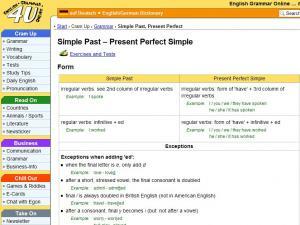 Comprehensive list of the uses of the present perfect with a section reviewing the past participle of verbs. Detailed explanations and quizzes. This is part four of a lesson in five parts. In this part, the teacher practices using time expressions and finally begin the study of the present perfect progressive. This material compares and contrast several verb tenses including the present perfect and the present perfect progressive. 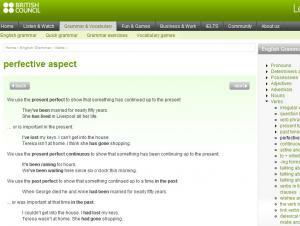 A great, detailed online lesson for the Present Perfect Tense. 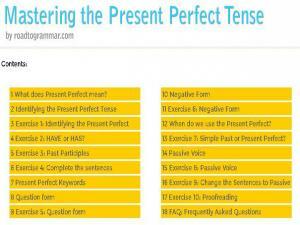 Go through the 18 separate sections and learn about the form and meaning of the Present Perfect Tense. There are exercises to complete as you go through the module and a FAQs section at the end. You can also download the whole module as a PDF file. 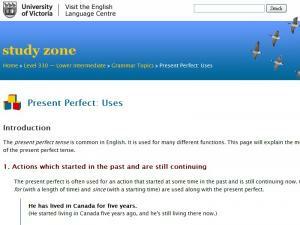 This free English lesson you will learn how to form the present perfect, present perfect continuous and when to use them.